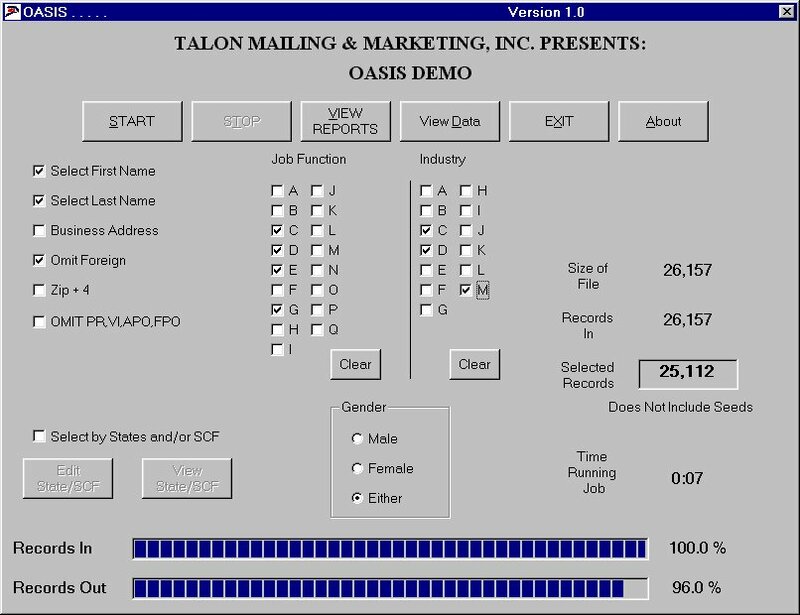 Welcome to the Talon Mailing & Marketing October 2015 Newsletter. Stick with direct mail. It works. 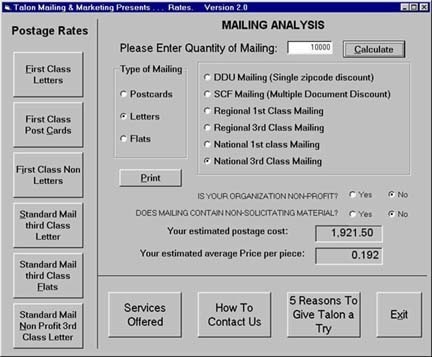 In fact, in today’s world, direct mail works better than ever if you implement a smart program. I recently had a client, who happened to be a first-time candidate, question the effectiveness of direct mail advertising. She was convinced that direct mail was only effective with older voters (ages 65+). In today’s world of smartphones and tablets, she argued, people under the age of 65 are no longer conditioned to rely on snail mail, much less pay attention to direct mail. She couldn’t have been more wrong about the impact of political direct mail, and fortunately I was able to convince her before she made a potentially fatal mistake for her campaign by ignoring mail as a communication tool. So let’s break some of this new “conventional wisdom” about the impact of direct mail. Contrary to what some may think, the numbers show that direct mail is scanned or read more now than ever before. In a world with so much other distraction, direct mail is becoming more effective not less. The numbers bear this out. According to the U.S. Postal Service’s “Household Diary Study,” 79 percent of households at least scan their direct mail daily and 55 percent report they read all of their direct mail daily. That’s compared to 47 percent in 1987. These numbers hold across all age and demographic groups except for high-income households where scan and readership rates are even higher. Even Millennials still trust and read direct mail—research from Money Mailer found that 90 percent of Millennials find direct mail to be reliable and 87 percent actually like getting information from retailers in the mail. Two big reasons for these numbers are that the widespread use of email (how many of you get all or most of your bills by email now?) has reduced the amount of mail in your box (according to the USPS the average household only receives two pieces of direct mail per day), and more sophisticated targeting ensures the direct mail individuals are receiving is actually relevant to them. Less mail in the mail box obviously makes direct mail pieces stand out more (especially if they are well done) and it’s just common sense that people are more likely to read direct mail if they find it relevant to them. The biggest piece in the box grabs people’s attention and that’s the ultimate goal of direct mail. That’s why I always recommend 8.5” x 11” mailers. It’s typically only two to three cents more piece to design and print an 8.5” x 11” compared to a smaller 5.5” x 11”. That’s a small price to pay to ensure more people notice your mail. I use the trash can/kitchen counter rule: Most people read or scan their mail between their mail box and the trash can or the kitchen counter. They never really look at it again. Make sure your direct mail is easy to read and designed to convey its central message in the time it takes to get from the mail box or the kitchen counter. There’s a good chance you can get them to read or at least scan both sides of a flat mailer during that time but a much lower chance they’ll open up a folded piece. The only time I use voter contact mail that must be opened is in very special circumstances when the extra space is a must have and you have a real hook to get people to open it. Even then I make sure that all of my key points are contained on the exterior of the mailer. One of the first things most folks will notice on your mail is the photography. It’s essential that you have appealing imagery. Don’t skimp and use pictures the candidate’s friend or staffer made with their smartphone or 10-year old camera from the attic. Bring in a professional photographer and take at least twice as many photos as you think you’ll need. Photos and imagery are one of the things that will catch and keep your audience’s attention. Your content can be top notch, but if your imagery is not many people will never even notice the content. And avoid cookie-cutter mail at all costs. Your target audience is smarter than you think and quickly discards cookie-cutter pieces. With the abundance of voter data available today there’s no excuse for failing to precisely target the audience of your direct mail. Relevancy is a must for ensuring your mail is read. Unless you’re setting out with an extremely small audience, develop a plan to divide your audience in as many ways that make sense (be careful not to go too small making your per piece printing cots unreasonable). Then focus on the specific messaging that works with that audience and utilize imagery that has specific appeal to those folks. This is perhaps the number one way to maximize the effectiveness of your direct mail program in today’s world. Both direct mail and digital advertising allow you to microtarget specific groups of voters with precision. Make sure your target audience is the same for both mediums and keep your messaging and imagery the same or very similar. Then time your direct mail to ensure that it hits on (or at least very close to) the day the digital advertising ramps up. “The Little Book of Bigger Returns” (Royal Mail Group Ltd. 2011) shows that for businesses an integrated direct mail and digital campaign improves the effectiveness of online campaigns by 62 percent and improves ROI by 20 percent. The same is true for political direct mail campaigns. Andy Yates is Senior Partner and Co-Founder of Red Dome Group, a political consulting, issue advocacy, and public affairs consulting firm based in North Carolina and operating across the nation. Red Dome Group specializes in strategic and tactical consulting, direct mail, digital advertising, social media and web solutions and grassroots lobbying and mobilization. Direct Mail Beats Digital Advertising in Driving Consumers to Act. A groundbreaking neuromarketing study shows that direct mail continues to play an important role in the marketing mix, stimulating 70% higher brand recall and driving consumers to act. Commissioned by Canada Post and conducted by leading neuromarketing expert Diana Lucaci, the study used research-grade technology to measure the emotional responses of people interacting with digital and physical ad campaigns. The study is the largest of its kind ever conducted and focused on the essential elements of media effectiveness, including ease of understanding and persuasiveness. "In a data-driven world, this study reminds marketers that consumers are, ultimately, humans and their emotions are a driver in their path to purchase," said Diana Lucaci, the founder and CEO of True Impact. "The effectiveness of tangible pieces on the brain is undeniable and understanding when and how to blend physical and digital throughout marketing can work to create the best customer experience." Direct Mail is easy to understand and more memorable. Physical media requires 21% less effort to understand, and creates a 70 per cent higher brand recall. Direct Mail is far more persuasive than digital media. Where a 2% to 5% positive difference in motivation between two stimuli is considered a predictive indicator that consumers are more likely to act, direct mail generates a 20% higher motivation score than digital. This means it is factually better positioned to persuade. This dramatically exceeds the threshold researchers see as an indicator of future behavioral change. Direct Mail gets the message across faster. The context in which it is processed is optimal: quick glance, low cognitive effort and high motivation. Direct Mail is more likely to drive consumers to act. Researchers determine this by examining the relationship between persuasiveness (motivation) and understanding (cognitive load). This is known as the motivation-to-cognitive load ratio. In this study, only direct mail passed the crucial threshold necessary to trigger the desired action from the consumer. This is true across all age groups. To further enhance the effect of physical media, the study was also the first of its kind to examine it with the senses of smell and hearing. It found that direct mail's motivation score jumped when scent (perfume) or sound was included in the creative material. 'Sensory' direct mail outperformed standard direct mail and had a 30 per cent higher motivation score than digital media. The researchers developed two integrated campaigns featuring mock brands, applying the same creative and messaging consistently across each campaign's physical and digital media formats. The 270 participants underwent brain imaging and eye-tracking to test for the campaigns' ease of understanding, motivation and visual attention. Participants were later given memory tests to assess their recall of branded material. For a full copy of the study visit this link: www.canadapost.ca/action. Utilizing these 7 tips will help you increase conversions and get more from your marketing promotions. Carefully crafted copy can be the key to many things, from product descriptions that are subject to seriously healthy conversion rates, through to websites that engage the reader and lead them seamlessly over onto a contact form or online purchase. However, writing effective copy is somewhat of an underappreciated art form, particularly within the ever evolving and always changing realm of direct mail, with many novices attempting the feat only to find the ever growing copywriting industry to be understandably in-demand. So, here's a look at the specific realm of writing great copy for Direct Mail, which is an area of marketing that is seeing a particularly impressive resurgence. 1. First and forest: Understand that customers are ready and willing to buy - Companies are seeing impressive results from direct mail, with 92% of receivers being driven online towards a digital activity, and 86% reportedly feeling 'connected' to the business sender. So first it is important to appreciate that there are indeed opportunities out there to boost your bottom line. You just have to get your strategy right, for which your copy is central. 2. Focus on simplicity - Keeping your language simple should be your starting point with any piece of copy. So opt for short paragraphs, bullet points and the use of sub headings to create a great structure to scan. 3. Use images wisely and choose wonderful works that really work - Images are great for bringing your words to life, however you should be careful not to overcrowd your flyer: opting for one powerful image is better than choosing numerous smaller images that all jostle for attention. The power of visual communication is extremely important and quality images establish credibility and are the most important factor in discerning the credibility of materials. 4. Opt for an angle... and really sell it - Always have a strong angle and a singular message for clarity. Whether this is "My course will teach you everything the experts know about marketing" or "Learn the industry insider tips to becoming a copywriter": make it punchy, make it powerful. 5. Create a story - Harnessing a story is great way of promoting a human element to your offering, and consumers love to have a realistic story line to buy into. Finding a newsworthy angle is so important and can be the determining factor in whether you succeed or fail. So consider a rags-to riches storyline, which has proven to be particularly effective within marketing, if it so fits in with your service or product. 6. Be intriguing, creative and useful - Offering the reader a reason to head on over online can be key to capturing what you need from them, be this a purchase or the entering of information, such as an email. So be intriguing, offer them something that will only be fully revealed or provided once a set task is undertaken. Of course this should also be something that is genuinely useful to your target market, such as a must-read guide to cutting outgoings, boosting marketing or harnessing online discounts. 7. And finally... consider hiring a professional - If all else fails, or if you simply fail to create the impactful words that you'd been aiming for, then you should consider turning to the professionals, particularly as the freelancing realm has never been so accessible. Direct copy can be extremely powerful and still works extremely well in this day and age. Utilizing the aforementioned advice will help you increase conversions and get more from your investment. Monday November 2, 2015. Nets vs. Milwaukee 7:30 PM. slack.com - Bring all your communication together in one place. Real-time messaging, archiving and search for modern groups and work-teams. startupgrind.com - The largest independent startup community, actively educating, inspiring, and connecting 215,000 founders. Startup Grind has helped millions of entrepreneurs find mentorship, connect to partners and hires, pursue funding, and reach new users. codementor.io - Live help from more than 3,000 Domain experts across 100 categories. Also, live programming help from experts via screen sharing, video, and text chat. gifs.com - Sooner or later this had to happen: make gifs out of YouTube videos. onetoday - One Today lets you easily give $1 each day to causes and nonprofits that inspire you. calm.com - Helps you discover how simple meditation really is, and how taking a few moments out of your day can make you happier and healthier.